Neile Graham and Kij Johnson, fellow World Fantasy Award winners and Clarion West alumnae. 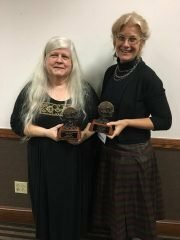 We are delighted to announce that Neile Graham, Workshop Director for Clarion West, has received the Special Award for “fostering excellence in the genre through her role as Workshop Director, Clarion West.” Neile accepted the award at the 2017 World Fantasy Convention award ceremony on November 5. The World Fantasy Awards are a set of awards given each year for the best fantasy fiction published during the previous calendar year. They were first given in 1975, at the first World Fantasy Convention, and have been awarded annually since. This award is one of the three most prestigious speculative fiction awards, along with the Hugo and Nebula Awards (which cover both fantasy and science fiction). The 2017 World Fantasy Awards were presented at the 43rd World Fantasy Convention in San Antonio, Texas, on November 5, 2017.